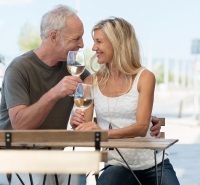 Sure, every senior dater believes in romance. But unfortunately for many seniors that notion includes a first date. Not necessarily saying that a first date can’t be romantic, but most times, it isn’t about falling in love, but rather to get to know each other in a meaningful manner. Seniors who still don’t believe a first date is an interview are wasting their time, which isn’t a commodity seniors have to squander. The very idea of getting swept off your feet on a first date is so foolish that it defies explanation, other than an old, unrequited fantasy left over from teenage dating. And love at first sight is the dating philosophy of the clueless. Dating requires a clear head, a solid game plan, and the smarts to know how to use both. Men in particular love the idea of wining and dining a woman on a first date, mostly because they think it’s romantic. But if the person sitting across the table from you in a restaurant is a total stranger, then how can the idea of romantic be smart? Senior guys typically like to meet a woman and close the deal quickly before they even discover who the woman they are seeing really is. This is actually falling in lust, not love, which takes a fair amount of time to discern. A first date is an opportunity to find out whether or not a second date makes sense, if you share good dynamics and any other use is self-defeating. So can senior daters accomplish this over coffee? Absolutely, and a coffee date is the smartest choice for several reasons. Meeting at a café can take away a lot of the first date pressure. It’s usually quite crowded, with lots of other coffee drinkers who are around you, making the feeling less intimate and more casual. If your conversation is not going well and you feel spending more time would be a complete waste, it’s not impolite to leave. Simply state that you appreciate your coffee date taking the time to meet you, tell that person you honestly don’t see the potential for a relationship, and get up and leave. There are many reasons you’d likely feel like exiting early on, and hopefully you gleaned these reasons because you asked the right questions in a straightforward manner. There are at least 6 questions I always asked on a coffee date, and after 49 coffee dates with only a few second dates, I met my partner on number 50. She answered all 6 questions perfectly and without hesitation. She also turned them around on me, which I thought was smart. If you’ve done any personal growth work you’ll want to find out whether your date has, too, because every relationship runs into problems, and it’s only the skills learned in therapy, a group, books, or from friends, that can help resolve issues. Absent these learned skills relationships get bogged down in circular arguments that never get resolved and simply wear down both partners. No one should consider taking the responsibility to teach a partner these skills. We’re not each other’s therapists, and that type of emotional dialogue quickly devolves. I asked every senior woman this question on a coffee date and not one was offended by it. Nearly all were eager to answer because they wanted to know what work I had done. No one is going to ask this question over a romantic dinner with candles on the table, that would risk ruining an evening and having to sit with someone they knew was inappropriate for hours. An equally important second question is about a date’s relationship history. Asking about when your last relationship ended, and why? What was your part in its failure? What did you learn from it? Again, no one would ever ask this over a candlelight dinner. But past relationships often suggest future relationship successes, and someone who doesn’t take responsibility for past failures isn’t likely to take responsibility for their behavior with you either. I asked this question and was never rebuffed. Women were eager to ask me the same question. If you think you’re smarter than every senior dater out there, and that a romantic dinner is the best way first date, then continue on your fantasy highway. But you’ll likely leave a dinner date filled with illusions and nothing else. First dates over dinner aren’t smart. Coffee dates are. You feel prepared for the first date, but have no clue what to expect for the second date? Check out this article to get some great advice for a second date.